I haven’t posted in a while but now that the New Year has begun I’ll be posting a review every Monday for all of my readers. Thank you again for your support! Starring four legends like you’ve never seen them before. 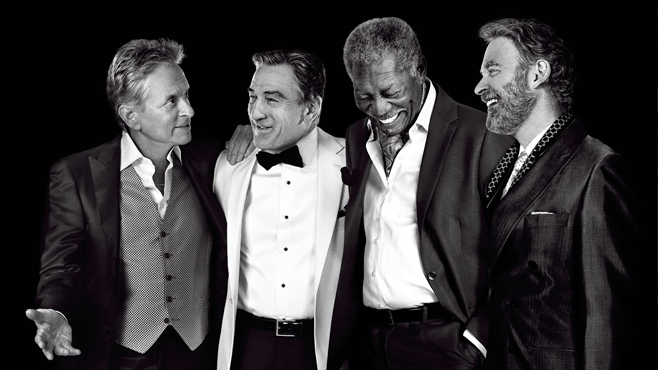 Last Vegas stars well-known Academy Award winners Robert De Niro, Morgan Freeman, Michael Douglas and Kevin Kline. If you loved The Hangover and The Bucket List than you might look fondly upon Jon Turtletaub’s indulgent, high-concept comedy about a group of rapidly aging childhood best friends living it large in Sin City. Faded Brooklyn buddies Billy, Archie, Sam and Paddy reunite in Las Vegas after 58 years of friendship to celebrate the much-anticipated wedding of their ring leader Billy. He’s a long-lived bachelor who has finally decided to get hitched with a fair-skinned beauty half his age, not surprising when you notice his coppery skin, silk shirts and mostly invisible insecurities. The old buddies embark on a weekend through the fantasy world of modern-day Las Vegas, whistling at young girls by the pool, gambling and drinking alcohol to their heart’s content. Morgan Freeman plays the wily gentleman Archie, a naturally gifted gambler who struggles with his health to the point where he’s not entirely intact with his sons family. Robert De Niro smiles rarely, so naturally he’s cast as the killjoy of the group. De Niro reveals his tough side once again and proves that despite his age, he’s still got it. Michael Douglas is cast as the privileged, charming old dimwit who’s terrified of growing old. Kevin Kline elevates the film with his provisional failure, carrying the notion that he is terribly worn down. Kline manages to downplay every scene and line, timing punchline moments to advance his character’s wit. Thankfully, a soulful performance from Mary Steenburgen, an older night club singer, provides the film with at least a little heart. I suppose the film would have had edge if the characters had really been prepared to misbehave. Despite the frequent humorous moments, Last Vegas isn’t a film I am fond of neither a film that I would recommend you watching.There are extraordinary scenes that I won’t describe, except to say they were terribly written, ridiculous but somehow painfully funny. The film faded from my memory instantly once the credits rolled, much to say that Last Vegas is simply a mockery of previous successful films based in Sin City, like The Hangover. Last Vegas is a ninety minute picture with a few bright moments, starring the actors you like in a comedy of unmeasured proportion.